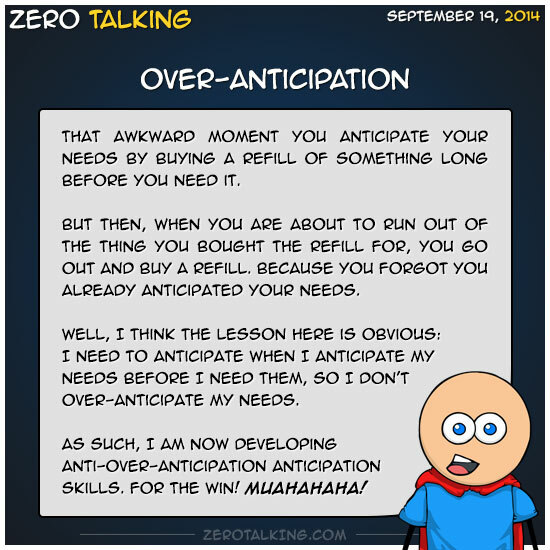 That awkward moment you anticipate your needs by buying a refill of something long before you need it. But then, when you are about to run out of the thing you bought the refill for, you go out and buy a refill. Because you forgot you already anticipated your needs. Well, I think the lesson here is obvious: I need to anticipate when I anticipate my needs before I need them, so I don’t over-anticipate my needs. As such, I am now developing anti-over-anticipation anticipation skills. For the win!